Lombardy Poplar is a specially-chosen form of the black poplar, familiar from European art and holidays. Its wonderful narrow upright form is sure to please everyone and makes a perfect tall accent in your garden. With an amazing growth rate of six feet or more a year, this is the ideal tree for a quick privacy screen. With that kind of growth your screen will be thick and dense before you know it. 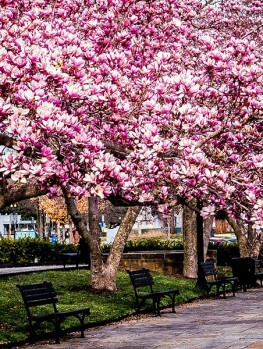 This beautiful tree catches everyone’s attention and makes a real statement on your property. It is especially useful for an instant screen while the rest of your planning becomes established and matures. The Lombardy Poplar is a fantastic privacy tree or windscreen. This poplar grows to reach between 40 and 60 feet, often reaching that height in less than 10 years. 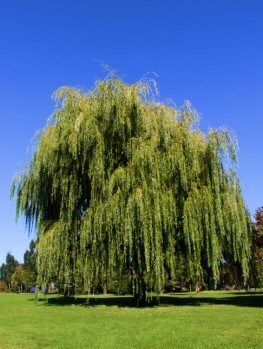 Lombardy Poplars are popular landscaping trees in the United States because they grow extraordinarily fast. Expect between 6 and 9 feet of growth, though some planters have reported as much as 12 feet of growth in a single growing season. The Lombardy Poplar also offers a unique, textured silhouette, which provides a striking contrast to many other common privacy screens. The Lombardy Poplar is best-suited to a gardener with the need for a privacy screen who enjoys the eccentric shape of the poplar. 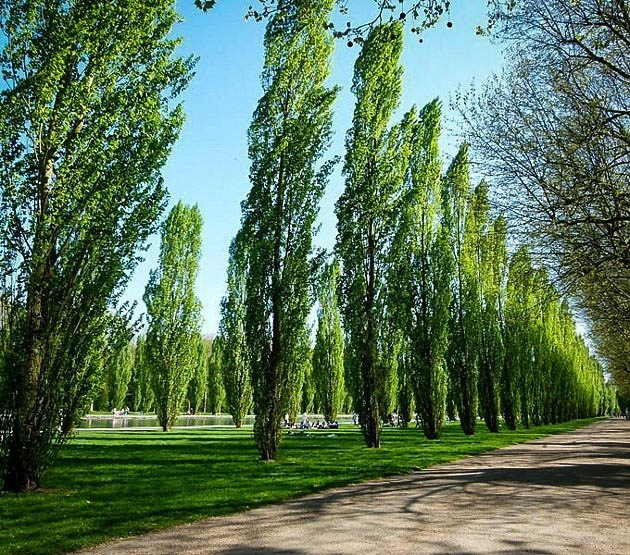 As with most Poplar trees, the Lombardy Poplar’s growth rate range may vary based on planting location, sunlight exposure, watering schedules, and soil composition. However, it generally has a very fast growth rate of between 6 and 12 feet per year. 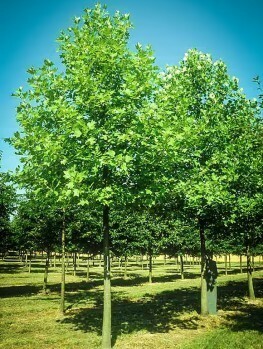 The proper planting and daily care of the Lombardy Poplar can help to ensure a fast growth rate. The Lombardy Poplar is one of the best privacy trees provided by The Tree Center! Fast-growth, aesthetic appeal, and hedge properties make it a perfect fit for the homeowner searching for a pleasant privacy screen. 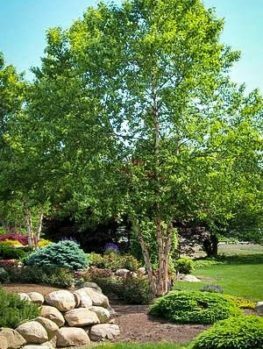 Your Lombardy Poplar will reach between 40 and 60 feet in height at an exquisite growth rate of between 6 and 12 feet a year. 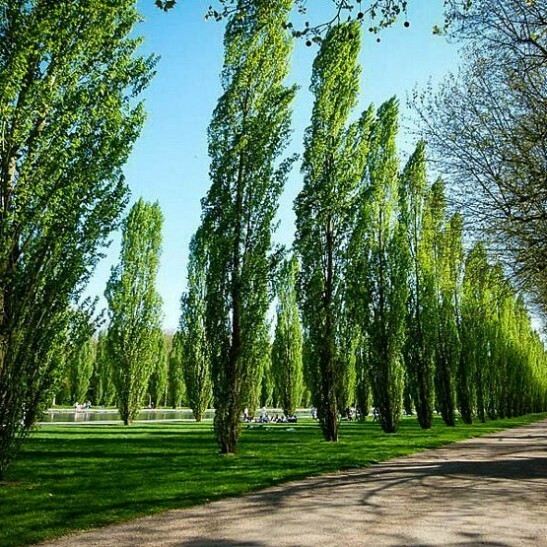 These poplars grow beautifully in uniform rows, so plant several between 5 and 8 feet apart. In just a few years you will have the best privacy screen in the neighborhood! Appealing appearances make the Lombardy Poplar popular not only with privacy seekers, but also ornamental enthusiasts. This poplar is reminiscent of a Cypress tree, though it is, in actuality, a Cottonwood. The upward-facing branches provide the Lombardy Poplar with its special texture and shape. These are prized among landscapers for this reason. Rich greens displayed in the spring and summer are replaced with brilliant yellow leaves in fall, offering yet another beautiful seasonal display. 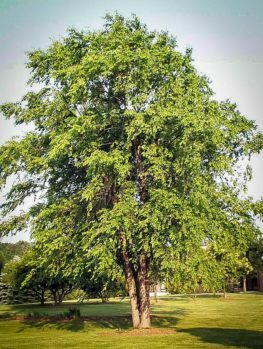 The Lombardy Poplar is a great choice for residents living throughout the contiguous United States because it is adaptable. Poor soil, drought conditions, even mild pollution can be prevalent in your area and still the Lombardy will succeed. Although your Lombardy Poplar prefers well-drained soil, it can tolerate poor soil conditions, too. Part of the reason this poplar grows so well in so many locations is because it is able to adapt to a variety of sunlight exposures and watering schedules. Though your Lombardy Poplar prefers to be watered 1 inch or more a week, it can tolerate mild droughts, too! When mature, the Lombardy Poplar will reach between 40 and 60 feet tall, easily blocking out unwanted sights and sounds. Additionally, this Poplar specimen reaches between 10 and 15 feet wide, making it an ideal privacy hedge. The Lombardy Poplar grows well in the full sun to partial shade, so the first step is to find a location on your property that matches these needs. Once you’ve identified the best planting location, dig a hole twice as wide as the Lombardy Poplar’s root ball. The hole should be one inch less deep than the height of the root ball. The root ball should, therefore, extend out from the hole about one inch, which will enable the tree to settle over time. Once the tree is in the hole, hold it vertically while backfilling with soil and water. Using mulch is a great way to help conserve water and increase the health of your plant. If you are using mulch, apply a 3 inch layer in a 3 foot radius around the base of your tree now. If you are planting the Lombardy Poplar as a privacy screen, plant several in holes between 5 and 8 feet apart. 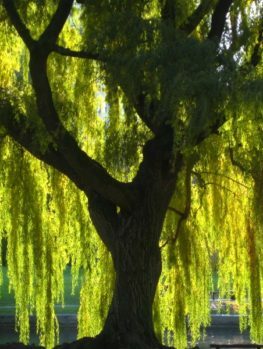 The Lombardy Poplar is an adaptable tree – so poor soil, minimal water, and partial shade will hardly affect the growth of the Poplar. However, your Lombardy has the misfortune of being prone to several diseases and pests. It is best to monitor the tree carefully for signs of canker, leaf spots, rust, caterpillars, borers, and aphids, which have all been spotted on the Lombardy Poplar. Monitor for signs of these and take the appropriate action – whether it be through a chemical or organic pesticide or fungicide or through some other means – to help keep your Lombardy Poplar standing tall! Beware – not all Lombardy Poplars are the same! Be cautious since many cheap nurseries will try to sell you bare-rooted saplings grown from branch cuttings, which will not develop into high quality trees. Even worse – many nurseries will attempt to replace your Lombardy Poplar with a poorer variety, so they can save money. These replacements will often lack the very properties that make the Lombardy Poplar great! Avoid this. 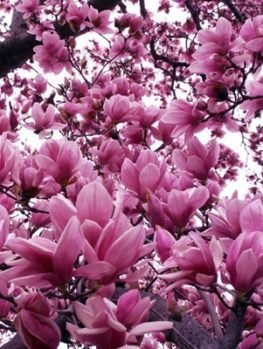 Instead, visit The Tree Center where top quality arborists will care for your Lombardy Poplar during the initial stages of growth. Our essential early care then passes on to you, and the proper planting and daily care you provide is what makes the tree succeed. 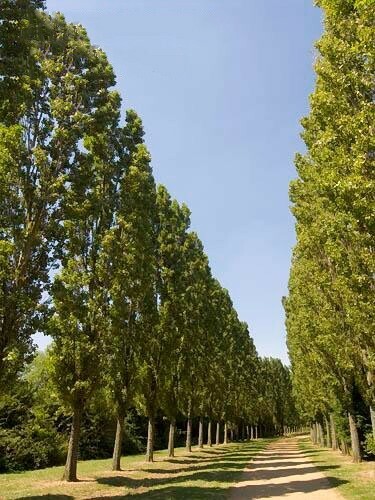 Trained professionals will provide you the best-quality Lombardy Poplars on the market. The Tree Center has a wide range of Lombardy Poplars available for you today. But act now as our stock is always changing and our supplies are limited.